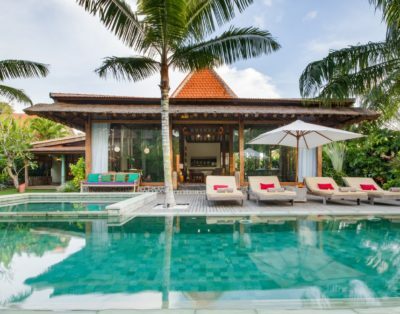 Villa Tibu Indah is a cluster of about three pavilions that embody traditional Balinese architecture with the conspicuous alang-alang thatch roof as the predominant design element. 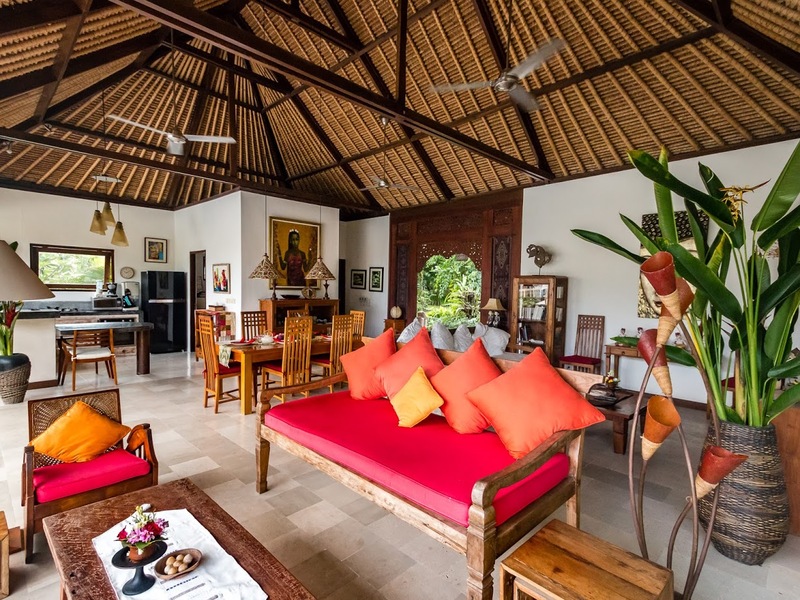 The property is quite compact yet the available space is well allocated to accommodate all the essential amenities that will assure absolute comfort and delight. 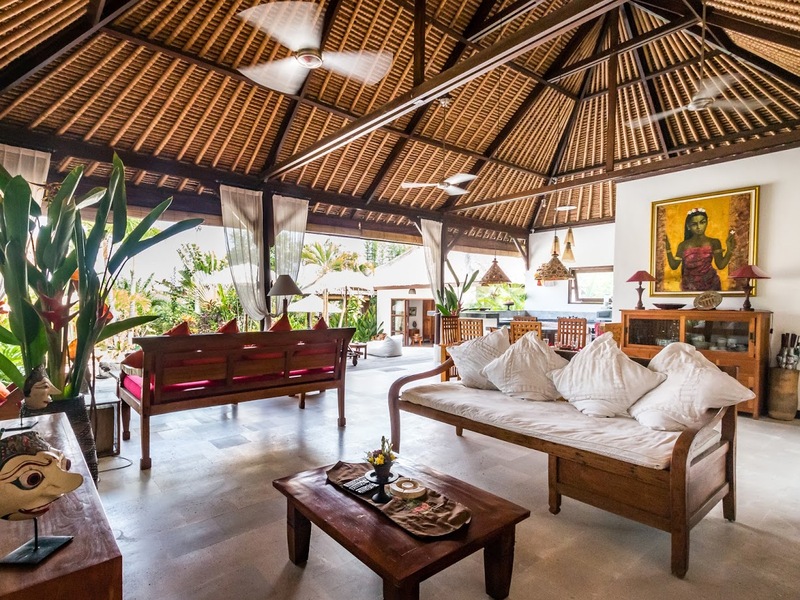 Interiors are appointed with elegant period furnishings and distinctively Balinese décor – creating for the villa an air of nostalgia. 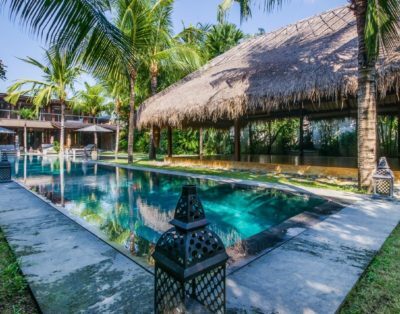 Built amidst the famed rice terraces of Canggu, Villa Tibu Indah affords you a truly rustic yet chic as well as an exotic Balinese break. 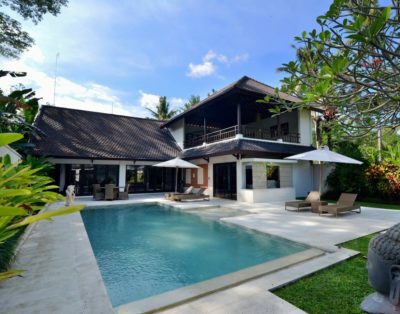 At the center of the villa – directly accessible from any of its pavilions – is the 12-meter swimming pool. Dip into alluring, crystal-clear waters for some aimless wading. 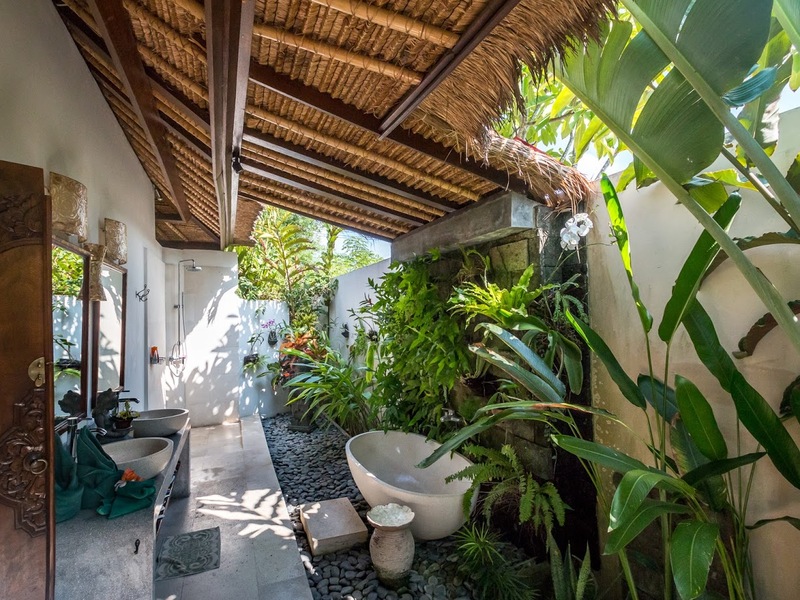 Or, pull everyone in for some splashy fun and games. 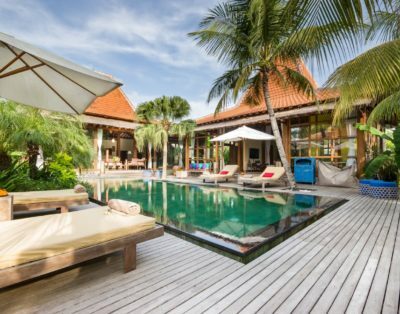 If you prefer to bathe, instead, in the sun, laze on the cushioned wooden pool beds or bean bags partially covered by large umbrellas on the wooden or stone decks. 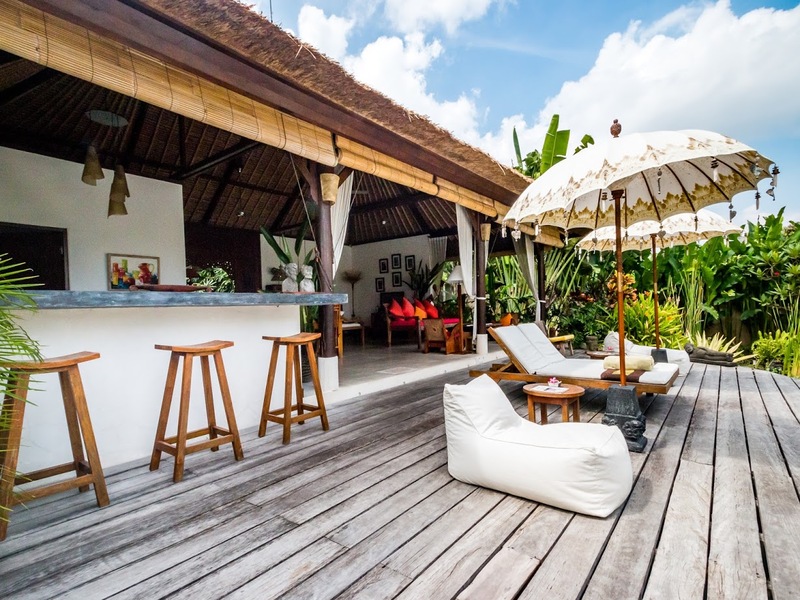 You can also choose to leisurely lounge by the alfresco bar as you enjoy your favorite cold drink. 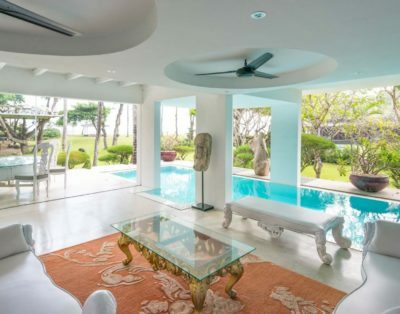 Facing the swimming pool is the airy, semi-open and high-ceilinged main pavilion. 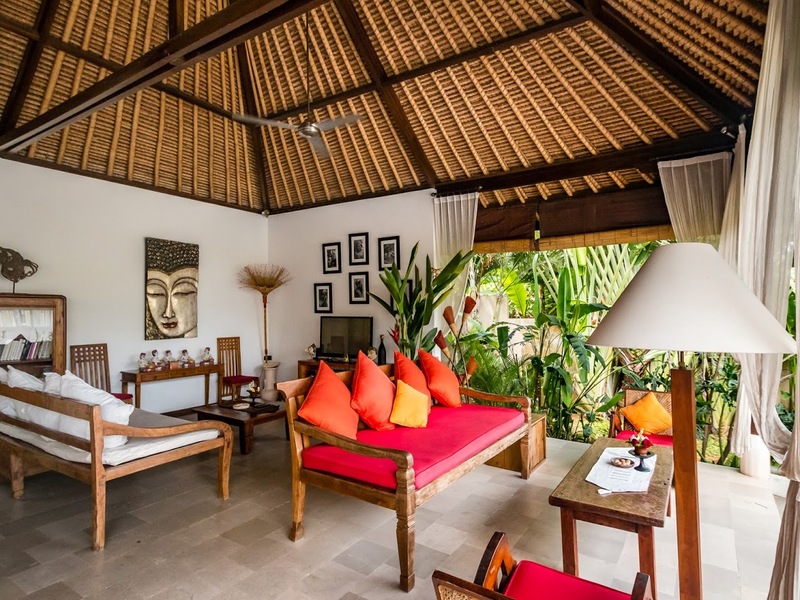 On one side of this pavilion is the living area with its cushioned, wooden benches and chairs. Here, you can all assemble for some amusing and animated sharing and storytelling. Or, to catch your favorite TV program then watch, once again, your all-time favorite classic film. Just behind one of the benches is the dining area. 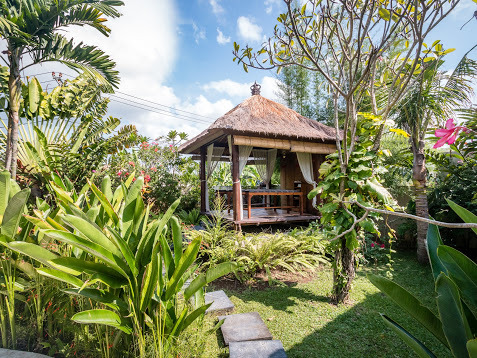 On its wooden table for six, you can all feast you authentic Balinese cuisine – as well as your most requested comfort food – concocted by the in-house chef at the fully-equipped, modern kitchen alongside the dining table. 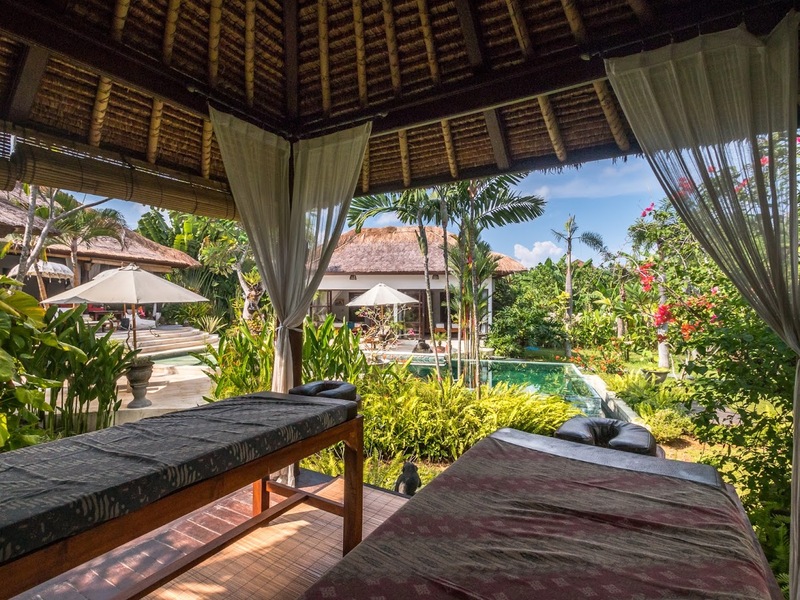 On balmy early afternoons, ease your aching muscles with a traditional Balinese massage at the villa’s spa bale amidst the garden’s lush tropical foliage. 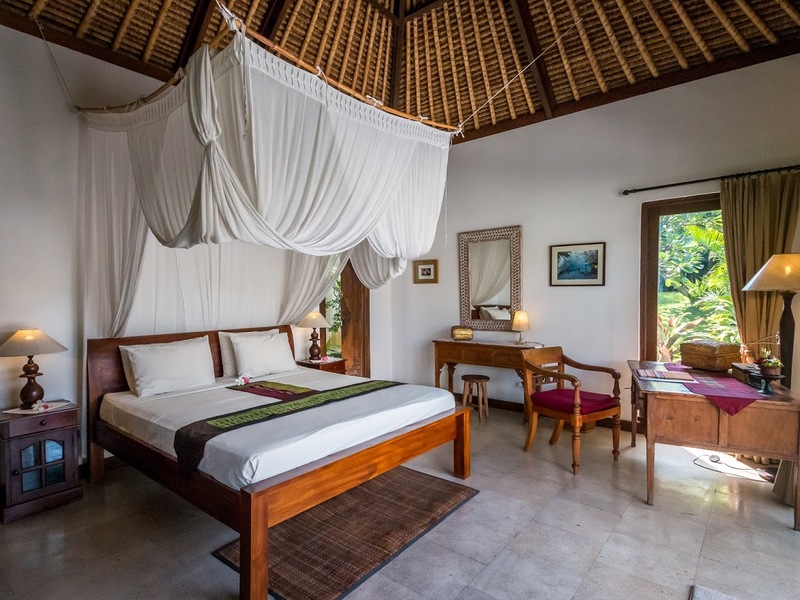 The villa has three bedrooms. 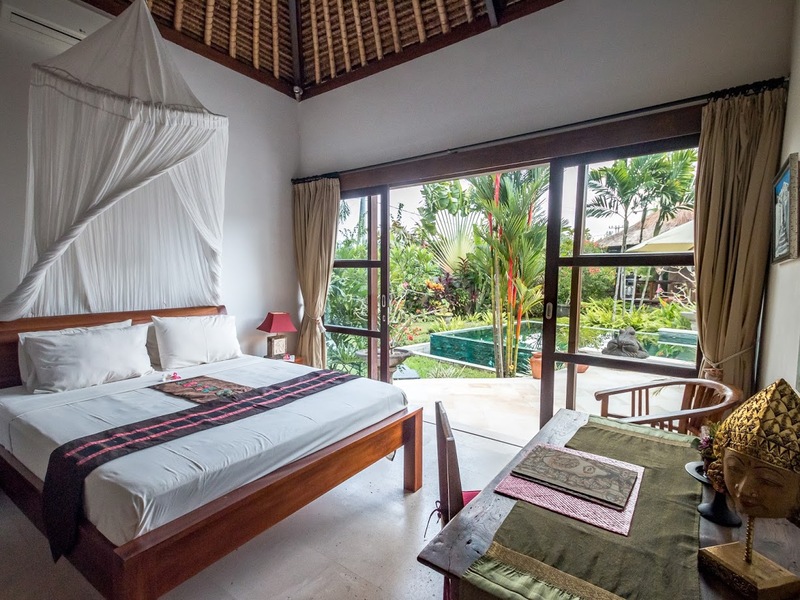 The master bedroom is in one of the poolside pavilions. 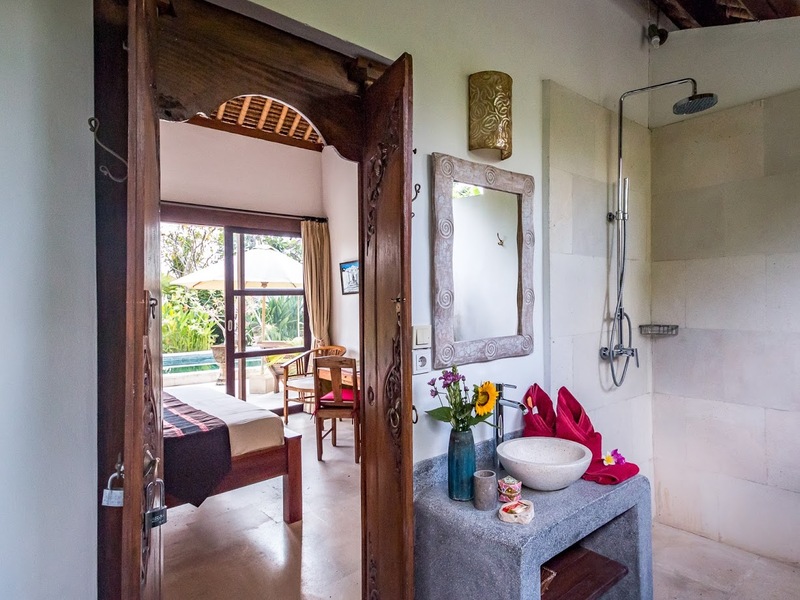 This bedroom has an elaborately draped king-sized bed and a dedicated bathroom with an outdoor rain shower and a large bathtub. 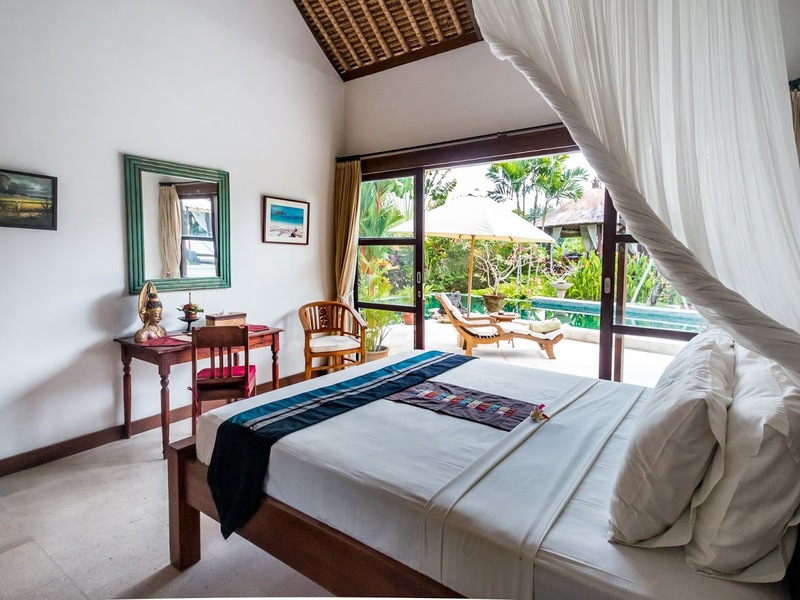 This bedroom also opens out to the swimming pool. 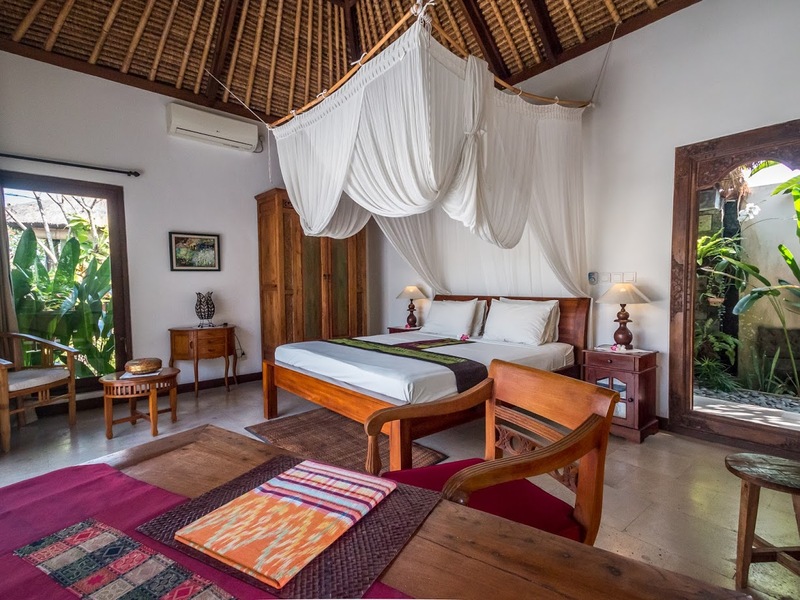 Just across, in another pavilion, are two other guest bedrooms. 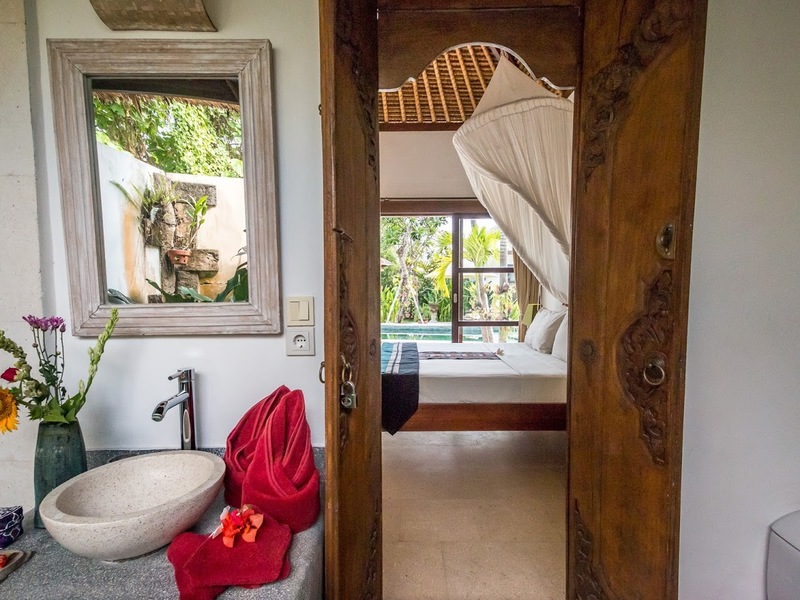 Both have draped, queen-sized beds and dedicated bathrooms with outdoor rain showers. 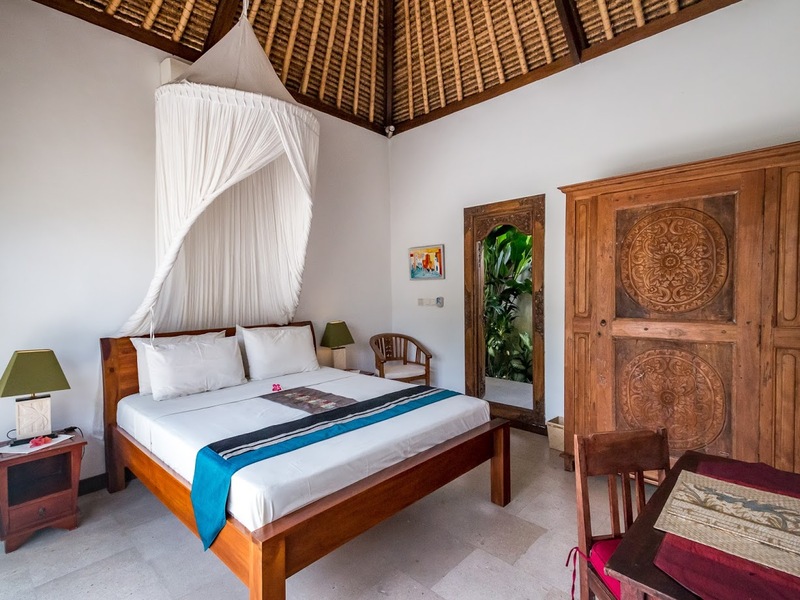 Both bedrooms also open out to the pool. 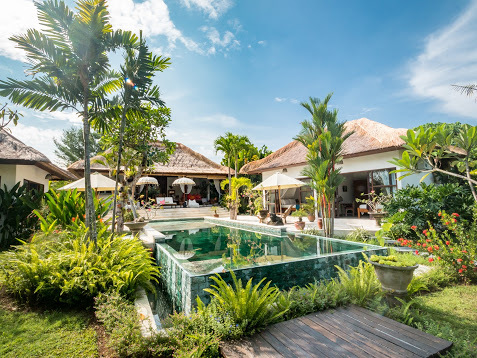 Assigned to attend to the villa’s services is a staff headed by a villa manager backed by a personal guest assistant, a housekeeper, a pool attendant, a gardener and a security corps. In addition to the chef, a babysitter, a driver, a laundry helper and a spa therapist are on call. However, their services will be charged separately. A car is also available for rent. 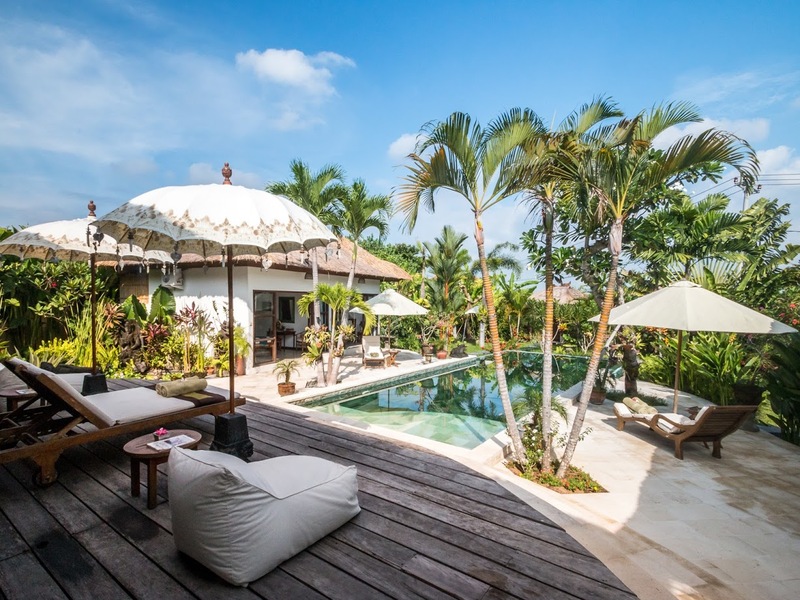 Villa Tibu Indah is in the heart of Canggu. 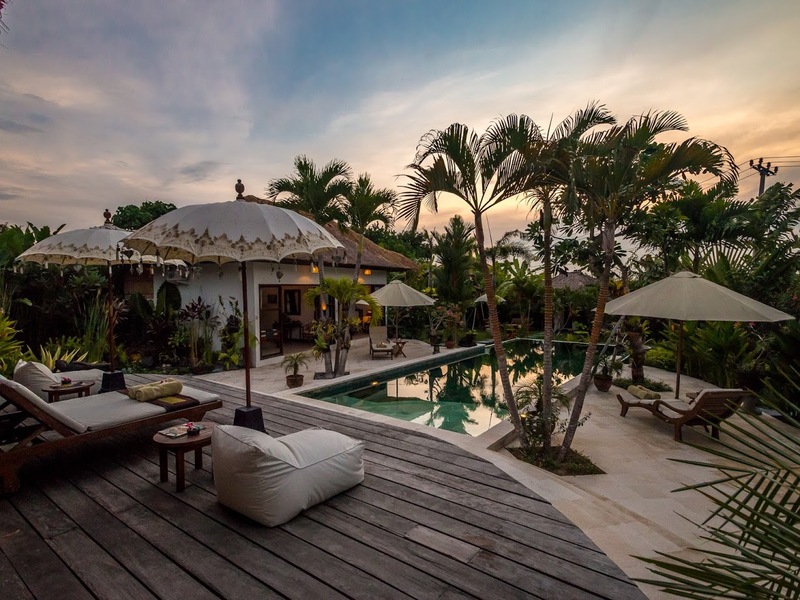 A 10-minute drive from the villa will take you to Pantai Batu Mejan – more commonly known as Echo Beach – one of Bali’s hottest surfing destinations. Along its shores are cafes and restaurants where you can enjoy cocktails, barbecues or buffets with the breathtaking sunset as the backdrop. 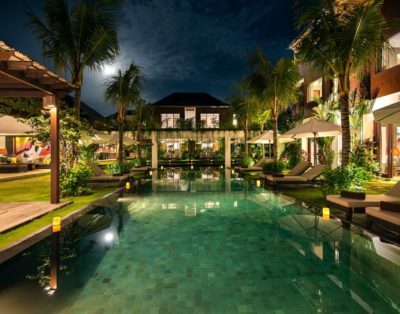 Highly-recommended are Dian Café, Sticky Fingers, Osteria Italiana, Sate Bali and Echo Beach House. On another occasion, drive to the ancient, off-shore temple Tanah Lot and watch cultural dance exhibitions. 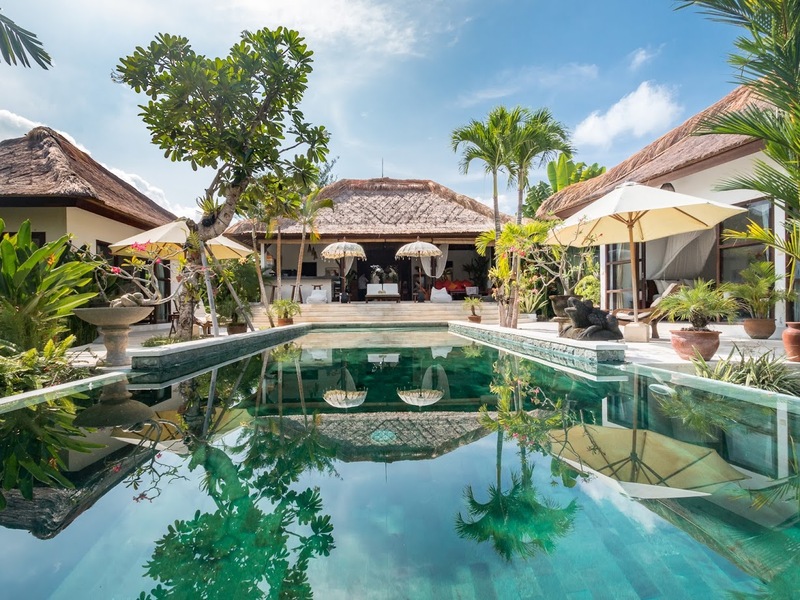 See if your game is also at par with the Nirwana Golf Club’s 18-hole championship course that traverses rice fields and ocean-side cliffs.